"Speed & Style," speaks for itself, doesn't it? The Mons Royale Dual Speed & Style Innsbruck showcased some aggressive pace and lofty senders. The high-power halogens of the RockShox Innsbruck Pump Track Challenge drew the world's fastest pumpers like moths to a flame. The RockShox Innsbruck Pump Track Challenge was a flowy, action-packed ride with some surprises in the mix! 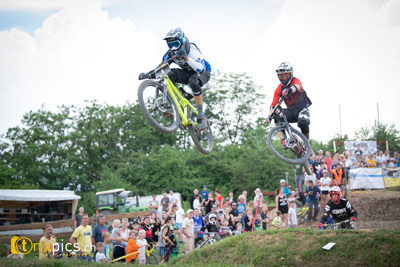 4 Cross, Slopestyle und Pumptrack Action war am 3. Panzergelände Festival in Reutlingen zu sehen. Mit einem frisch gebauten Dual-Pumptrack ging es Freitagabend los, ging Samstags bei Sonnenschein und warmen Temperaturen mit dem 1. Gold Event der European 4Cross Series weiter und hörte mit den Slopestyle Finals kurz vor Regenbeginn auf.